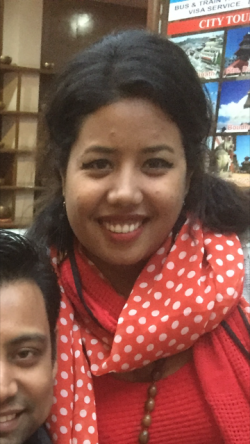 Manjila Dangol is from Panga and now currently living in Kathmandu. She is working as a Senior Officer in a renowned commercial Bank of Nepal-Mega Bank. She has been in the banking sector for more than five years. With the help of Nepal Education she completed her MBA (Masters in Business Administration) from Kathmandu University; one of the reputed universities of Nepal. She is immensely thankful to her sponsors Lotten and Larjerik for their valuable support. And also Pi Charlotte and Svante Strindberg for being always there for her and her sister Bhabika in all ups and downs. She gives warm regards to all the Swedish friends who have contributed a lot in sponsoring so many girls for betterment of their lives and the whole society as well. She says, ”Nepal Education is a family where you can be yourself, improve yourself, get a familiar support and most importantly get involved with very good people.” She is thankful to the whole team of Nepal Education for all the support she got not only for her studies but for her overall development.